The manufacturing plant of Continental Biscuits is located at Sukkur, a city located in Sindh, 500 kms from Karachi. It is one of the main rural and semi-urban centers of Pakistan with a population exceeding one million. Sukkur is world-famous for its’ delicious dates and it is the home to Sukkur Barrage which is one of the oldest artificial irrigation systems in the world. Sukkur also holds a large number of Riverain forests since it lies on the course of Indus River. 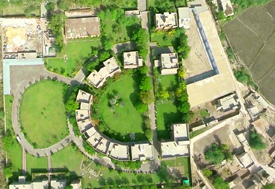 Our plant and its’ residential colony are multi storied buildings built on 15 acres of land surrounded by lush green gardens and trees. The colony houses more than 50 employees who reside here with their families. There is a club house with modern gymnasium facilities for visitors and guests and for those traveling to Sukkur for business purposes. These red brick buildings amidst lush green lawns with exquisite wild life and natural beauties provide a picturesque sight to its viewers. The serenity of the environment surrounding our factory is immensely relaxing. Our plant is operational since 1986, initially the manufacturing of biscuits commenced with one production line which now have expanded to six lines making biscuits round the clock to meet customer’s demand. We are continuously increasing its’ manufacturing capacity by installing more production lines. These lines operate on automatic PLC control and semiautomatic mode under extreme hygienic conditions. We have highly qualified staff to handle the factory operations.